the world or save mankind!" 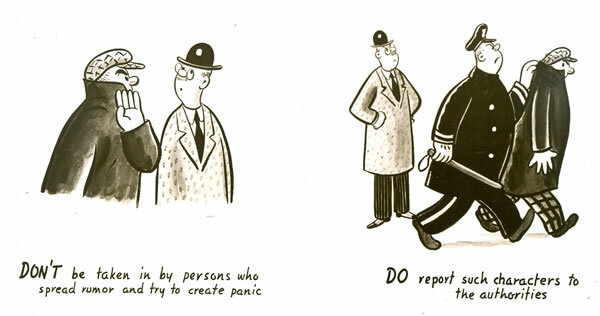 This cartoon is one of a set dashed off by Syd after war was declared. He took the set, which shows how to behave in wartime, to the Civilian Defense Volunteer Office, as a contribution without charge to National Defense. 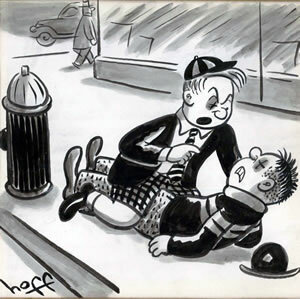 The following Hoff cartoons were created for Arnold Forster, an American Jewish leader who was a longtime executive and general counsel of the Anti-Defamation League (ADL) in New York City. In 1952, Syd sought the legal advice from Forster as the FBI was beginning to question his involvement in left-wing politics during the 1940s. 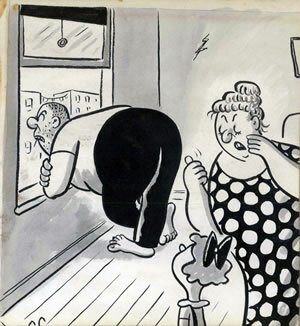 According to his agent, Scott Meredith, some of Syd’s “Redfield” cartoons appeared in the Honolulu Record and Daily People’s World – publications which were allegedly Communist controlled or dominated. 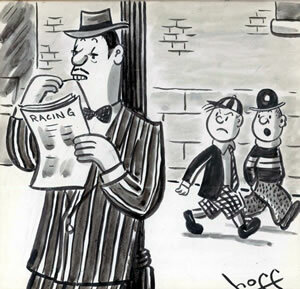 Syd also learned that his publisher, E.P Dutton & Co., decided to suspend publication of a new Hoff cartoon book due to this alleged report. Syd subsequently decided to give a voluntary statement to the FBI in December, 1953. 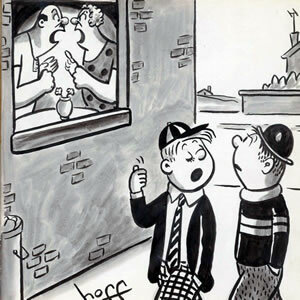 He acknowledged that while some of his cartoons had appeared in those publications, he stopped creating any Redfield work after the 1930s, adding that the two cartoons in question had apparently be reproduced with different captions by someone other than himself. Syd’s statement was recorded and filed with no further action taken by the FBI. Forster passed away in 2010. 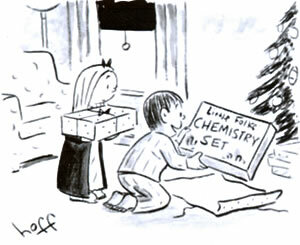 These cartoons remained with the family until 2012. when they were donated to the Anti-Defamation League, NYC by his daughter Janie Berman. 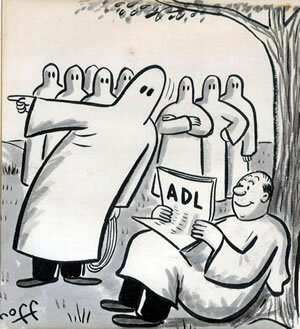 We thank Marvin S. Rappaport, Director of Leadership/Chief of Staff of ADL for sharing these cartoons. Syd lent his creativity to a number of causes over the years, including the ‘Bretton Woods Agreement’ of 1944. The following is an excerpt from We have the history of international finance after the last war, handled by the ‘right people’ with the ‘right safeguards.’ What did we get? - an article written by Eric Rauchway, Professor of History, UCDavis in 2011. 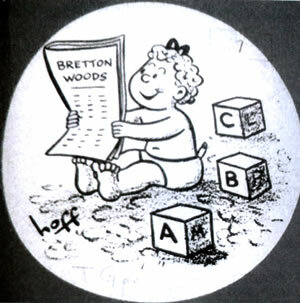 I came across Syd Hoff in my own research because he illustrated a pamphlet supporting Bretton Woods titled Bretton Woods is No Mystery published by Pamphlet Press in 1945. The pamphlet’s author, Joseph Gaer, was a UC Berkeley lecturer who wrote extensively about religion, labor, and Western authors (including Bret Harte and Ambrose Bierce). At the time he wrote the pamphlet, Gaer was director of the CIO PAC; shortly before that he had been an assistant secretary of the Treasury and before that worked for the Farm Security Administration and the Federal Writers’ Project. He was also founder of Pamphlet Press, which (the back cover explains) worked “to find the area of agreement among all the progressive groups of our nation and unite them on the issues of their common concern”. Franklin D. Roosevelt’s 1944 re-election campaign included his famous speech to the Teamsters Unions on September 23, 1944. 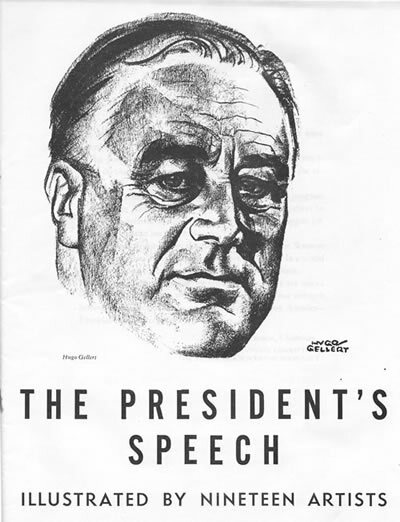 Included in this pamphlet are illustrations by 19 notable artists supporting FDR’s re-election to his 4th term near the end of World War ll. 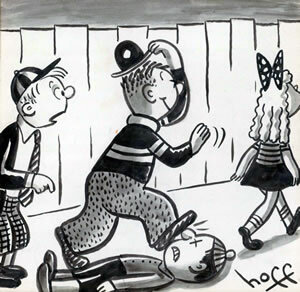 Among the notable artists are William Gropper, Syd Hoff, Rollin Kirby and Crockett Johnson. 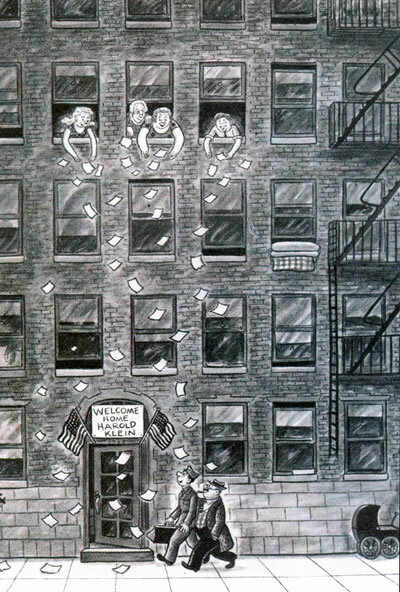 Many of the illustrations are related to the Depression and the New Deal, with special focus on World War ll and the nearing of victory against Hitler and Japan. 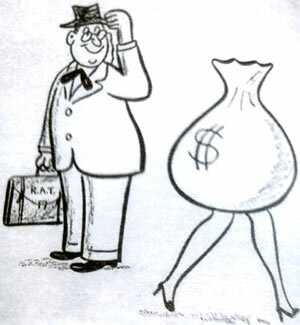 This cartoon was drawn sometime between 1947 and 1949 after the Freedom Train began its cross country tour of more than 300 cities in all 48 states. * The Freedom Train was an idea created to instill patriotism following World War II. The train carried the original versions of all the major US freedom and rights documents. Citizens were invited to ride it, Hollywood stars rode it and Bing Crosby and Irving Berlin penned songs honoring it. 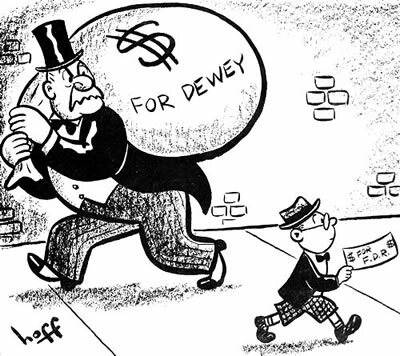 It was during this time of civil unrest that artists such as Syd Hoff, Carl Sandburg, Dr. Seuss, Langston Hughes and many others involved in the twentieth-century leftist movement began to question the real motives behind many government programs. In the case of the Freedom Train many documents that represented workers freedom were omitted from the train and even worse, Blacks were either segregated on the train or prohibited from riding it all together. 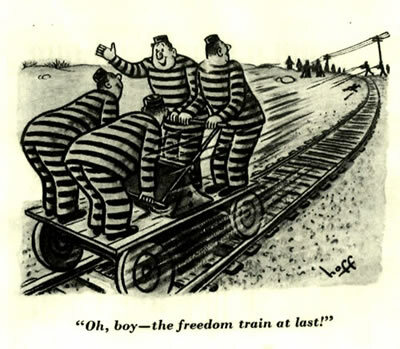 The cartoon was penned to show an alternate view of the Freedom Train.